A rare encounter between two gas-rich galaxies indicates a solution to the problem of how giant elliptical galaxies developed so quickly in the early universe and why they stopped producing stars soon after. The galaxy pair was initially identified by ESA’s Herschel space observatory as a single bright source, named HXMM01. 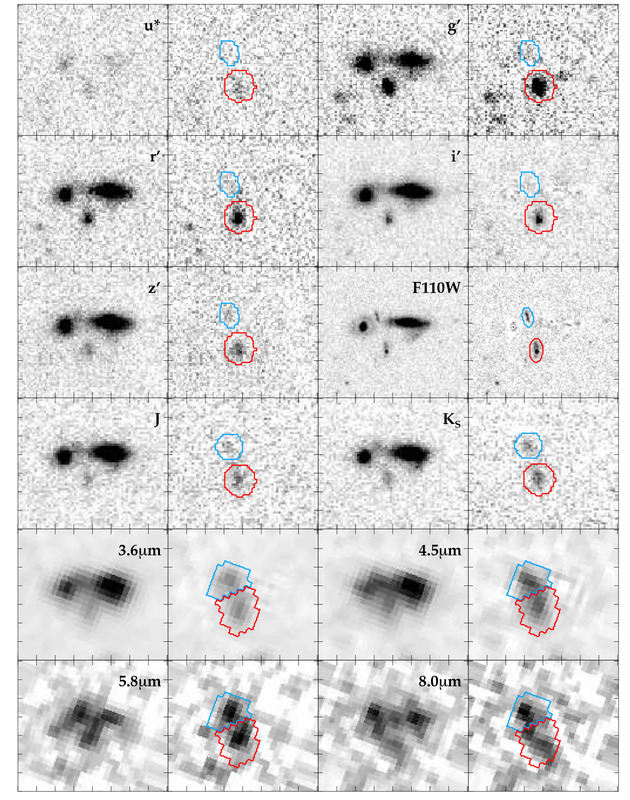 Follow-up observations using both space and ground-based telescopes, including the William Herschel Telescope (WHT), showed that it is in fact two interacting galaxies, each boasting a stellar mass equal to about 100 billion Suns and a similar mass of gas. The galaxies are the most efficient star-forming factory ever found in the Universe at this epoch, when the Universe was only 3 billion years old. Such a high star-formation rate is not sustainable, however, and the gas reservoir contained in the HXMM01 system will be quickly exhausted, quenching further star formation and leading to an aging population of low-mass, cool, red stars. Astronomers estimate that it will take about 200 million years to convert all the gas into stars, with the merging process completed within a billion years. The final product will be a massive red and dead elliptical galaxy of about 400 billion solar masses. One idea is that two spiral galaxies might collide and merge to produce a vast elliptical galaxy, with the collision triggering such a massive burst of star formation that it would rapidly deplete the gas reservoir. In the present study, astronomers have captured the onset of this short-lived process between two massive galaxies, providing the best observational evidence that massive elliptical galaxies can rapidly assemble from the merger of two spiral galaxies in the early Universe. Images of HXMM01 and its two major components, X01N and X01S, obtained using the CFHT, HST, WHT and Spitzer telescopes. The images of the WHT, obtained in the J and Ks bands using LIRIS instrument, are part of an International Time Programme, principal investigator: Pérez-Fournon (IAC). All images are 16"×14" and are aligned, with N up and E to the left. The ticks are at intervals of 2". For each filter, the original image is shown on the left and the residual image after subtracting the two foreground galaxies is shown on the right. The apertures used for photometry are outlined in the residual images (blue - X01N; red - X01S) [ JPEG | TIFF ]. H. Fu et al. 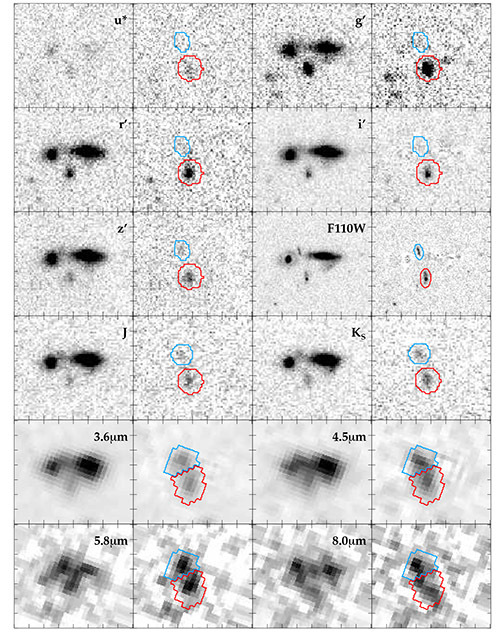 2013, "The rapid assembly of an elliptical galaxy of 400 billion solar masses at a redshift of 2.3", Nature, doi:10.1038/nature12184 [ Paper | Supplementary information ]. "Descubren cómo se formaron las galaxias 'muertas' del universo temprano", IAC Press Release, 22/05/2013. "Rare merger reveals secrets of galaxy evolution", ESA Press Release, 22/05/2013. "Herschel Space Observatory Finds Galaxy Mega Merger", NASA/JPL Press Release, 22 May 2013. "Fragile Mega-Galaxy is Missing Link in History of Cosmos: UC Irvine Discovery is Confirmed by Observatories Around the World", UC Irvine Press Release, 22 May 2013. "Mega-Galaxy is Missing Link in History of Cosmos", Keck Press Release, 22 May 2013.